The Daily Gem Bonus: Fox Tail Chair & WINNER!!! Hey Animal Jammers! 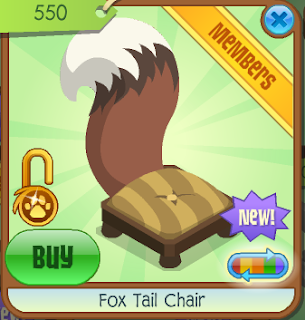 The new item is a fox chair. It's.... "Ok". Congrats Puppy on your amazing work! There are many mysteries of Jamaa. They are pretty much all over the place! Such as: Coral Canyons, Lost Temple of Zios, Sarepia Forest, and many many more! The one in coral canyons is the bridge there. If you get many people on the bridge hopping, it will crumble. Legend says that if it breaks, everyone will get free membership. I have no idea who started this rumor, but I wanna find out! The second one is in The Lost Temple of Zios. If you sleep by the broken zios sculpture, phantoms come out of it! It's pretty much like your having a nightmare!! AHH, SCARY! Haha, now let's move on. The thrid one is in Sarepia forest. The spirit of Mira protects that place. Many jammers also go there for clans and stuff like that. The mystery there is if you dance by the fire pit, Mira will stop for a visit. Pretty cool, eh? Thank you so much for entering and have an amazing day on AJ! Sorry for the wait! Blogger wouldn't save properly. I don't want to say my best, but she's a friend, and a good one too, something about the texture of her story just lit up to me. I usually choose the winner by how nicely done it is, how many correct answers you get, or the texture. Though this may seem hard to understand, well, I don't know. Sometimes things just pop up to me. I don't usually pick the entries by talent, unless it's a question contest. Not everyone has amazing talent at the same thing, and if you ask me, I would say I'm a terrible artist. Even if you are terrible at something, don't let it get you down! There's tons of things in the world other than art and quizzes. Thanks whatz, and I came to say bye. I will not be on for a while due to school. I will miss you so much. P.S. PINK TOP MANIA!!! report! Have fun with Zios!